I do love these linens! Love the colors...they are so festive and happy! Beautiful! Oh gorgeous! Very colorful tablescape! I received my package yesterday and am already plotting my AC table! I love it- just so HAPPY! I love all the bright and cheerful colors. Great idea on the potted plants too! 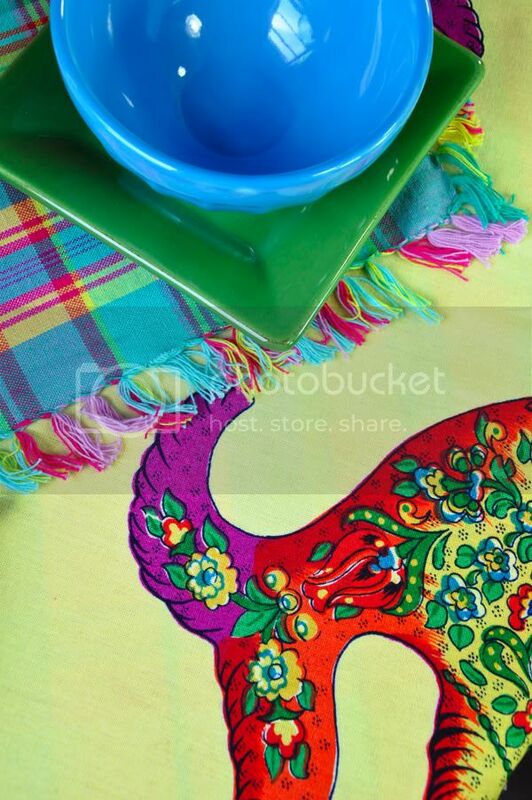 What a vibrant table...♥♥♥ it! I use the potted plants too.. The colors are just so bright and cheerful, it's a party! The napkin rings are too cute! 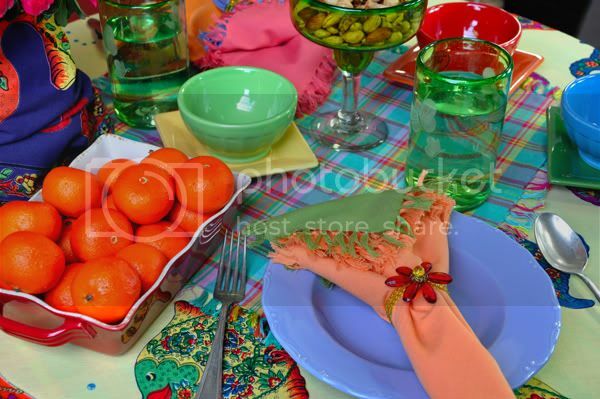 I just love all the summer bright colors in your tablescape! What a great tip on the azalea! The tablecloth is so whimsical...just love it! The fish are like beautiful little mosaics with all their wonderful designs! 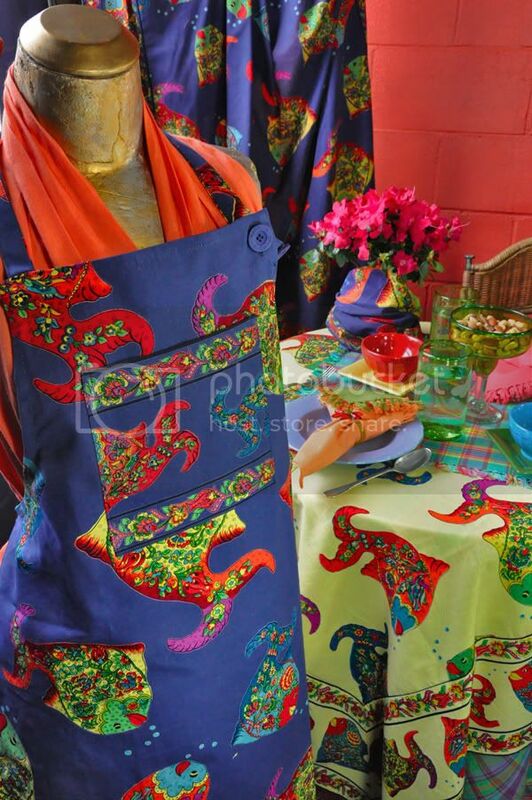 Beautiful napkin rings and that is the cutest apron! Your fabrics always make me smile! Gorgeous table - love the colors. Great tablecloth. Dropping by from BNOTP, link #1. Very bright and festive! love it! Stunning. I love how you put it all together, all the color combinations. 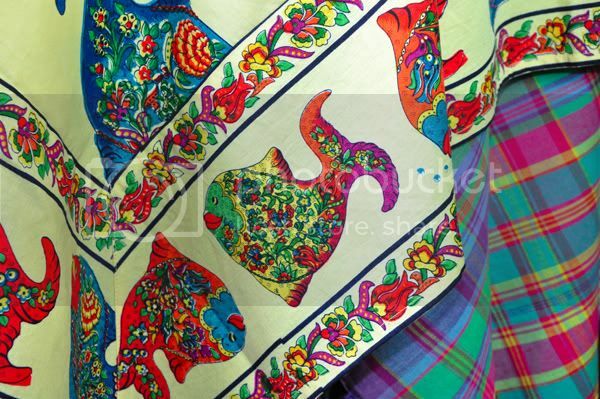 I love the fish print in the fabric. Thanks for the fantastic post. 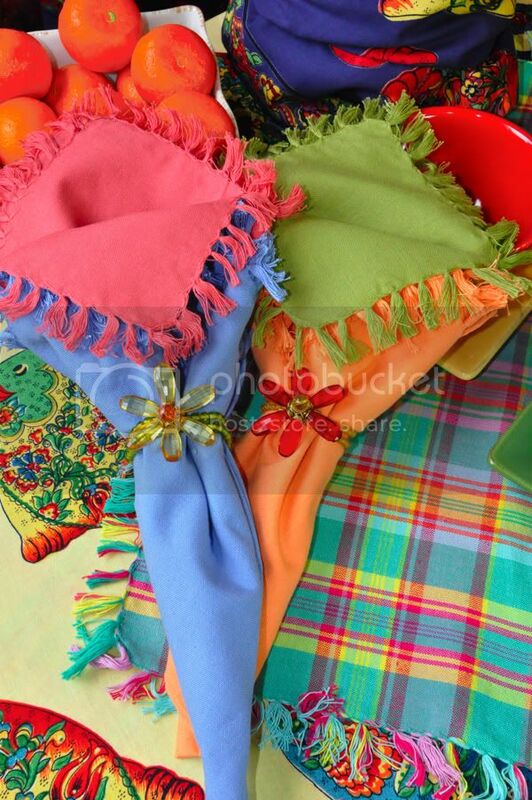 So colorful and beautiful, love how you displayed your napkins! 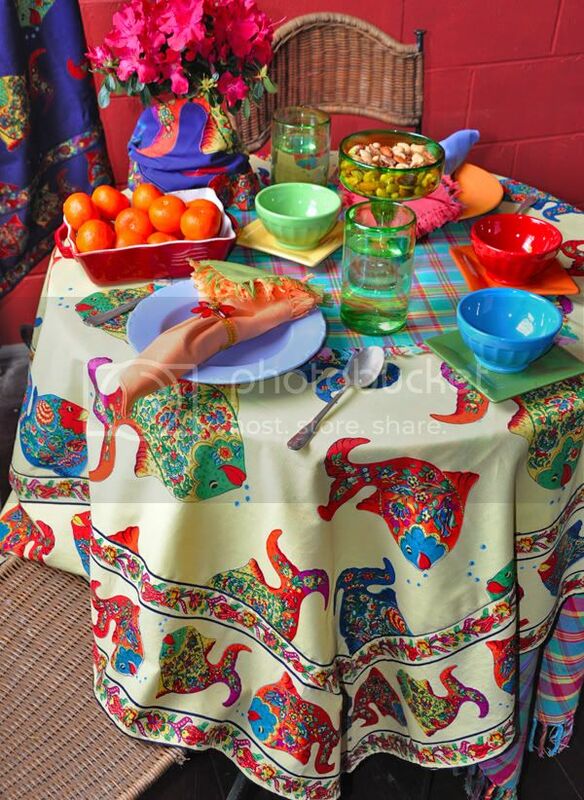 I think that fish tablecloth is a "must-have" for my beach house! Love all the vibrant colors. April, perfectly toned to move into the warmer summer months. Great vibrant colors, I am loving this. Beautiful linens and gorgeous colors! 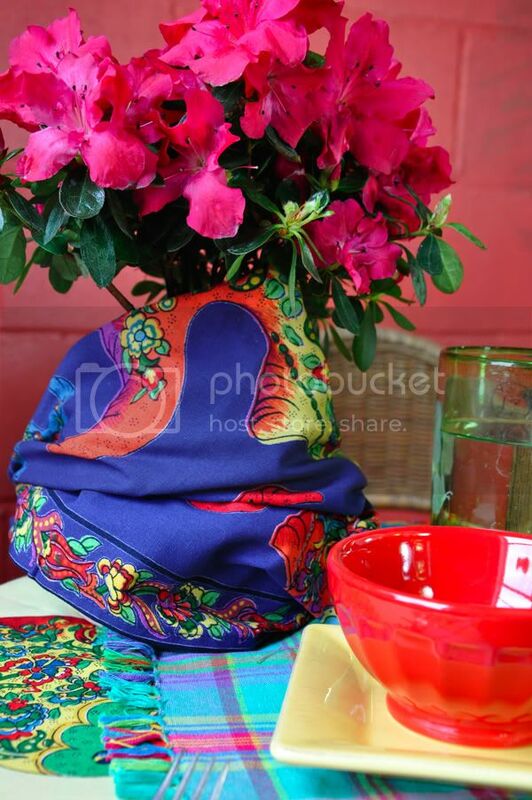 Love the whimsical feel, vibrant and bold colors. It says Happy! Oh my gosh! I am swooning!!! I LOVE these, the colors, the prints!! Youre patterns are always so inspiring to me! If only you could be a fly on the wall when I find something April Cornell in a store...I think you would get a kick out of the crazed, exciting public display I put on!! :) haha! I just found your blog and now you have another avid follower!